A holiday cottage built in 2009 with craftsmanship in a wilderness style, with a unique location in a sunny, shielded and secluded area, and a panoramic view of a small, scenic lake 30 meters away. You can go swimming, pick berries in the right season and enjoy nature in peace and quiet. The cottage is modern with a sauna and outdoor bath barrel, the latter found on the 100 m2 large terrace. 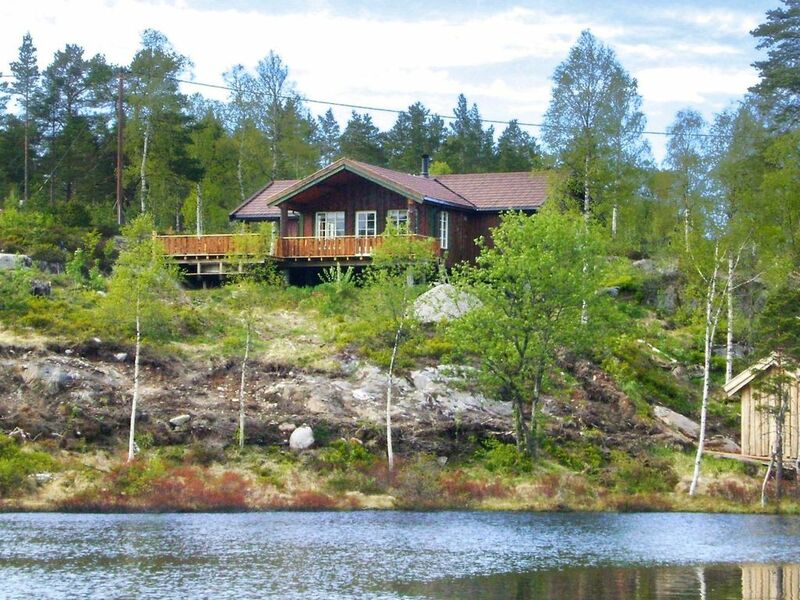 The cottage is called &quot;Ørneredet&quot; (Eagle's nest) as you can often spot eagles in the area. Deer and moose is neither an uncommon sight, and there are several paths leading into wild nature and lakes, summer and winter. There is a 10 ft rowing boat at your disposal by the lake. Only 1 hour drive to the coast, to Kristiansand, to Mandal or to the closest alpine skiing facilities. In summer you can experience rafting and kayak paddling in the Mandal river, approx. 10 minutes away by car. There is also salmon fishing here. There are fish lakes nearby and the owner can help you with a fishing license. Bath barrel is not available in winter. E- and F-price is winter high season. Larger groups can also rent the neighbour cottage, unit 76409, only 60 metres away (no pets allowed). You can buy access to internet from the owner, NOK 50 per day.